In the days before the Void consumed much of the Old World, there were stalwart humans, elves, dwarves, and gnomes who banded together to invade the deep places of the earth. These heroes forged unbreakable alliances in search of knowledge, treasure, and glory. Rival adventuring parties would often descend into the same dungeon, and these companies fought one another as fiercely as they battled the monsters that lurked behind every dark corner. These were daring times, when nothing in the world was considered more sacred than the oath that bound those who shared the dangers of the pit together. This was the age of the Dungeon Alliance. 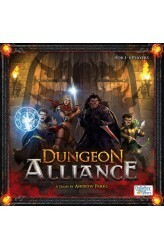 Dungeon Alliance is a deck-building, dungeon-crawling miniatures adventure game that allows players to send 1-4 different teams of adventurers i..